“You are amazing,” my vet would say with a reassuring smile. Our oldest dog, Kona, had several lumps on his body but one was getting too big. We attempted surgery, but she couldn’t safely remove the mass. I supposed it’s not unusual for a dog of his age. Kona turned 13 in August, though we never really knew his true age. My husband and I adopted him 12 years ago from the Coastal Humane Society to celebrate our first year of marriage. He was a stray, somewhere between 1 and 2 years old. Energetic and in need of a good home and a good meal. We knew it was meant to be when Kona threw his rawhide bone at us from his kennel and continued to “talk” to us as we looked at other dogs. It got to the point where we needed to bandage the large lump, and I had to purchase t-shirts from Goodwill to prevent Kona from messing with it. We started to talk about dignity. No self-respecting Siberian Husky wants to wear a t-shirt. And during warm weather no less. But Kona’s spirits were high. While we couldn’t take him on our off the grid camping trip, he was still up for hikes near our house. He was always our lead dog. “Most dog owners wouldn’t do what you are doing for Kona. He’s lucky to have you,” our vet would say. I think Kona knew his time on Earth was limited. When he got Hana, our intention was for her to have time with Kona so she could learn from him. He taught this brother, Kailua, so well. That’s what the leader of the pack does. Some people say their dogs are their best friends. I always called Kona my first born. He acted more human than dog. I joke that I don’t know what to do with “real” dogs. He was stubborn, independent and not overly affectionate. He was extremely vocal and told me off on more than one occasion. He complained about his food options and even turned down treats from well-intentioned passersby during walks. Kona was handsome and serious, but he did have a playful side. I could fill a blog with stories from his life. The run-ins with skunks. His love for the finest meats and cheeses. That time he disembodied Mr. Potato Head. The thing with Kona is that he was with me and my husband for just about every major milestone as a married couple. We’ve purchased two houses, had two children and welcomed two new dogs to our family since having Kona. We’ve gone on countless vacations, including a road trip to Tennessee with him. Kona didn’t always like to be the center of attention (unless you were going to give him steak), but he was always there. We said goodbye to Kona on Friday. It was one of the hardest things I’ve ever had to do. But we knew it was time. It was peaceful and sad. He felt happy and loved. It was tough just to leave the room at the end. When we walked outside the vet’s office, dark was just starting to set in. I held Kona’s collar tight and headed to the car. My husband and son, G, had stopped and were looking up at the sky. There was a lone star. It was big and bright and almost looked out of place. We stared at that star for what seemed like forever. We could feel Kona’s presence and said goodbye one more time. We watched the star as we drove the short ride home. We stopped one more time so I could take a photo by the river he used to swim in. Goodbye, Kona. My lead dog. My first born. I’ll meet you on the rainbow bridge. For my Giving Pledge this month, I will be donating to the Coastal Humane Society in honor of my first born and lead dog, Kona. 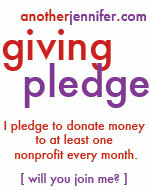 I also donated to Crossroads at a recent fundraising gala that I helped to plan and executive. Oh Jennifer. This brought tears to my eyes and really made my heart hurt. Animals are like children… such good companions, friends, babies. I am so sorry. I remember what it was like the day we had to put down our 11 year old cat, how much it hurt. I am really sending you a big giant hug. Thank you, Alexa. I appreciate your hugs and messages of support. This was the first time I’ve had to go through something like this. Even my husband, who grew up with dogs, had never had to put a pet down. The significance of Kona in our lives really made it tough. I have tears in my eyes as I am writing this. We’ve had to say goodbye a number of times and it is always so hard. I’ll be thinking of you and your family, and sending hugs your way! Thank you, Michelle. Kona was my first pet (besides saltwater fish). It was just hard all around. It’s never easy to say goodbye. thedoseofreality recently posted..School Conferences Provide Parents Quite An Education! It is hard, Ashley. But I suppose life would be far less exciting without these experiences, right? You just broke my heart. I am so very sorry for the great loss, Jennifer. I know what it feels like to put a beloved animal, and it tears out your heart. Kona was gorgeous!! What a special dog Kona was, and now he is at Rainbow Bridge. I do believe there is a Rainbow Bridge, and I do believe you found Kona for a reason. To fill your hearts, and to fill his, and to have all those special years together. Your first born will always be in your heart. Now he is in mine. Oh Cathy, your words means so much. Thank you. My sons are helping me put together a photo book honoring Kona. We’ll also share his story on the Rainbow Bridge website. We know he’ll always be in our hearts and we’ll meet once again. anotherjennifer recently posted..Help a Mother Out: Download the #MOAM #ebook for $0.99 Today! Thank you, Ilene. Your text on Thursday meant a lot to me. Kona actually walked side by side with me for the first time on Friday morning. (He’s a husky so he’s usually ahead of everyone!) It meant so much to me. It was like he was telling me that it was going to be okay. Oh Jennifer, I’m so sorry about Kona, but it sounds like you did the right thing for him. Big hugs! We did, Bev. I’m confident of that. I picture him running around like a puppy in a big field somewhere now. It’s a good thing I sent all of my work emails before reading this! Abundant tears. I cannot even imagine your heartache, but as many have said, it sounds like your family gave Kona everything he could ever want while he was here. You provided him with Heaven on Earth in his eyes: a second chance at life from the shelter and a family to love and care for. Because of that, he will be with you and watching over you all forever. Lots of fellow doggie-mama love!! Katie recently posted..Saltwater Harbor Launch Week! Thanks, Katie. G said he and Matt saw the Kona star on his way back from soccer this evening. He’ll always be with us. 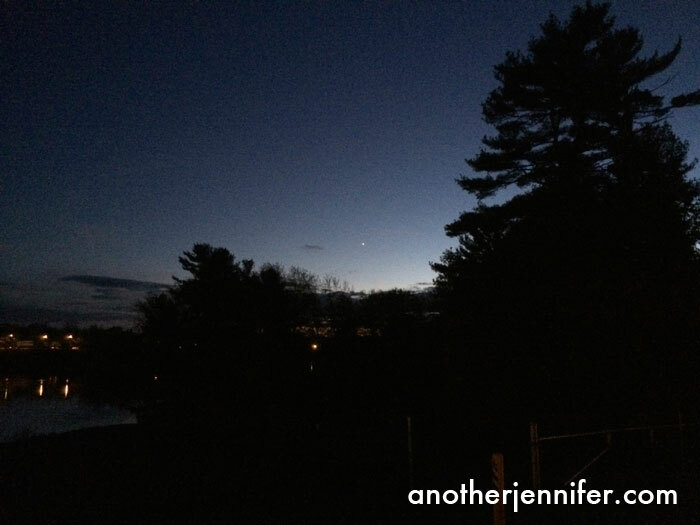 Such a beautiful post, Jennifer! I can imagine you were a great mom and he had a wonderful life. We will lose our GSD to cancer soon. Holding on to the moments. BIg hugs to you. I’ve known for a while that I would have to face that day, but I don’t think you’re ever prepared. We just tried to make the most of the time we had these past few months. Hugs back to you! What a beautiful post, Jennifer, and while I’m so sorry to hear of your loss, I’m so warmed by the amazing life you had with Kona. Sending you and your family much love. It was amazing. We are so lucky to have spent 12 solid years with him. Thanks, Deb. I know how you feel. We had to put my family dog down a few months back. It was hard, but so peaceful. I love that he said one last goodbye through that little star. Thanks, Ashlee. G saw the star tonight. He said it twinkled at him. I think we are all comforted by the fact that he is no longer hurting. Your prayers mean a lot to me, Chris. Thank you. I’ll be praying for you this week as well! I’m struggling here. I know we say sometimes that blog posts make us laugh and/or cry, and it’s a bit of an exaggeration, but this here is true. I am crying. Remembering my own journey three years ago when we put our Siberian Husky done. The end was peaceful. I still can’t cope with it on a bad day. I’m sorry for your loss. Ah, Kona. So loved. I have no doubt he knew everything – especially the good parts. I think they often do. Tamara recently posted..Goodbye Yellow Brick Road. I can’t imagine I’ll be able to cope with this on a bad day in the future either, Tamara. I love that you had a Siberian Husky. They are such special dogs. So very smart. In a way, I think Kona had been prepping us for this for a while. Sorry to bring up those hard memories for you! We certainly cried together today. Jennifer. I am so very sorry for your loss. Sending you love today. Thank you so much Tracie! I’m so sorry and I know how much you love your dogs. It’s such a hard thing to do, saying good-bye. Sending you virtual hugs. Susan Zutautas recently posted..That Is Not Classic Rock! I’ll take all the hugs I can get, Susan. Thanks so much! What a sad post Jennifer.Animal lovers and pet owners specifically sympathize with the loss of your cherished family member.It is such a hard thing,…. Hugs. Kona was my first pet (besides saltwater fish), so it’s really my first experience losing a pet. Kona was so significant in our lives. It’s going to be hard getting used to life without him! Oh dear, I can’t stop crying. I feel like I lost my dog all over again. The unconditional love and excitement when they see you. My heart breaks for you and your family. You will always love him and he will always be there right in your hearts. Thank you, Lisa. It’s nice to see you on my blog! I seem to be bringing up a lot of emotions for people. It’s nice to know I’m not alone in this experience. Our dogs are so precious. How lucky we are to have them. So sorry for your loss. It hurts. Nothing will help except…Time. It’s hard to wait for Time, but somehow in the interim, our hearts grow stronger and the hurts are slowly replaced by fonder memories…slowly…I still shudder when I think of HB’s last day and the guilt in wondering why I let him go on that one last Adventure. Sniff sniff. Thanks, Cyndi. I’m not sure if it’s easier knowing that it’s coming or not. I think it hurts either way. life measures quality, not length. take this with you…I loved you best. That is beautiful, Elizabeth. Thank you for sharing! Thanks, Leah. He had a great life and he made ours that much better. Thanks Raquel. It’s my first experience losing a pet (unless you count fish). It’s been tough, but we’ve been reminiscing about all the fun times we had with Kona. 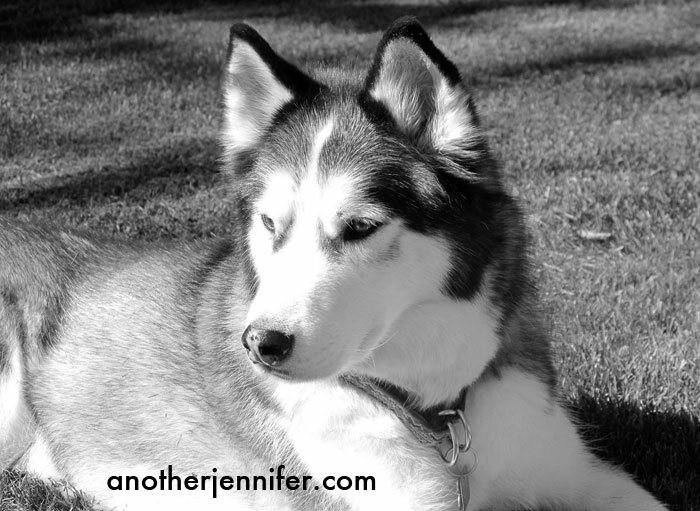 Kona was obviously a well-loved dog and he was lucky to have you, Jennifer. May you be comforted by your memories of him. Thanks so much Rabia. We were lucky to have Kona in our lives for 12 years. I was brought here from Tamara’s blog, and I have to say my heart is breaking so much for you right now. I know how hard this is, I’ve been thru it. Cancer is so cruel, to humans and to animals. I lost my little Nala to cancer, but I still have her son. Please know that we will say a prayer for you tonight and for your first born and leader. Thank your for you kind and thoughtful words, Melissa. I appreciate your comment and your prayer. Hi there, stopping by from Tamara’s blog. I am so sorry for your loss. Having just put my mothers nearly 16-year old dog down, just two months ago, I can feel your pain. I have a princess that I will find hard to let go, when her day is near. Big warm hugs to you, and a friendly tear for Kona. Thank you, Wendy May. I have really appreciated people sharing their own stories. It’s never easy to say goodbye to a pet who becomes so close. 16 is a long life. So many wonderful memories I am sure. I’m just right back there…then, having to decide…my keeper of secrets who was my savior in so many ways. Saying goodbye to him was the very worst, and also the well…I can very much relate to the peaceful and the sad. So so true, Kristi. Thanks for your words. Jennifer, big hugs for you. I have a four-legged first born too. Our Vizsla, MacAfee, is turning 10 in 10 days. He’s been with us since our first Christmas as a married couple, and he’s been the best companion, running partner, tent protector, bed hog, and big brother to his two-legged sisters. I know our time with him is limited, and I wouldn’t trade a moment with him for all the riches in this world. And I know when it’s finally time to say goodbye to him, he will be waiting for me at the Rainbow Bridge, just like Kona is waiting for you. Thanks for your words, Nicole. As heartbreaking as it was to say goodbye, i am so very thankful for the time we had with Kona. I knew I couldn’t read this post right away, but I’m glad I finally did. Kona was a special boy and I’m glad to have known him. Thank you for entrusting me with his care during his final year. He was such a special part of your family and I’m glad he helped me get to know your whole family. Having gone through the goodbyes so recently with my own best friend, Roxie, it was a really hard experience for me to say so long to Kona with you all. I know he appreciates all you did for him. Thanks for sharing your tribute with us. You were so amazing throughout this whole experience Amy. You and your team. I don’t know what we would have done without you. Thank you for sharing you experience with Roxie and for making those last moments as comfortable as possible. The donation that was made to Roxie’s Angel Fund in Kona’s memory really meant a lot too.